Anurag Kashyap's 2012 film “Gangs of Wasseypur” is being released in North America for the first time—its first half in theaters now, its second to be added next week—and with it the opportunity to see one of the most ambitious gangster films ever made, and quite possibly one of the best. Hyperbole is in no shortage in modern film criticism, but please put that grain of salt down. It is not necessary. 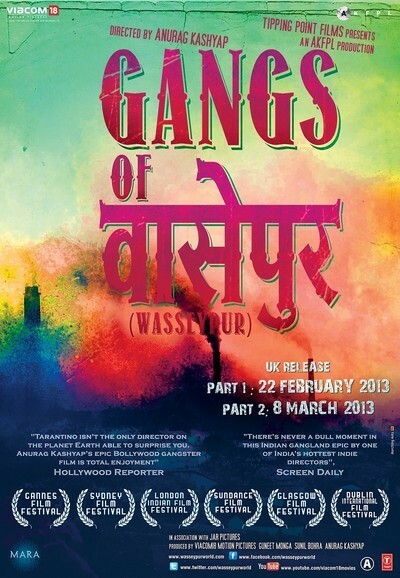 “Gangs of Wasseypur” is that good, and Anurag Kashyap will forever be a major filmmaker on the sole basis of making it. The film begins with a continuous four-minute take that starts on a television screen showing a Hindi soap opera and pulls out into the street, where armed gangs are furiously searching for a man, gunning down anyone in their path who might be his ally. They bomb his house. When the pressure becomes too much to bear, there is a cut, and with it, an exhale. But there is no loss of tension. The film powers forward, relentless, for the next five hours. Yes, “Gangs of Wasseypur” is over five hours long, which is why it has almost always been exhibited in two parts (Lincoln Center is screening it in one part). This may, unavoidably, intimidate some. There is no other way to tell a story of this magnitude, covering eight decades of life in the town of Wasseypur in northeast India, examining the intersection of organized crime, capitalism, and civic government in as exacting detail as it does, in any less time. This is without even mentioning the scale on which Kashyap examines the futility of revenge over three whole generations, which is rendered all the more tragic by the film's sheer scale. After the opening sequence, set in the present day, the story jumps back to 1941. With the aid of narration—voiced by a supporting character who plays a crucial role in the story over the years—the history of Wasseypur is laid forth. It is a key coal mining center in its region, and this becomes the focus of a rivalry between three parties: industrialist Ramadhir Singh, who takes control of the mines after India's independence from Britain; the Qureshi, who traditionally controlled Wasseypur; and Shahid Khan, a miner who was banished by the Qureshi for robbing trains, only to return to Wasseypur under false pretenses with the intent of stealing the mines from Singh. The lattice of interlocking conflicts and allegiances beginning with this dynamic end up lasting all the way to the 21st century, and never at any point cease to fascinate. In filmmaking terms, Kashyap seems at first glance to be more modest, shooting in a largely naturalistic mode, but the action is always impeccably blocked, especially in the longer takes within action sequences. While references to other movies (Eli Wallach's classic ode to gunfight pragmatism, “When you have to shoot, shoot. Don't talk,” from “The Good, The Bad, and The Ugly” is alluded to, as are countless references to multiple generations of Bollywood films and heroes, with the year 1995 announced not with a title card but by seemingly everyone in the movie having just seen “Dilwale Dulhania Le Jayenge”) are almost entirely in dialogue, there is one notable departure at the very end of the movie, with a pair of—mild spoiler—climactic deaths filmed in an extremely artificial way, as if to indicate that the only way stories of this kind end is through the artifice of cinema. In life, they continue ever onward, a point Kashyap subtly indicates with his camera. Any conversation about gangster movies going forward has to mention “Gangs of Wasseypur,” or it will be incomplete. In an age when the word “epic” has been devalued by overuse, it is a reminder of what the term truly means. It is Anurag Kashyap's calling card into the hall of legends. It is a violent, terrifyingly intense work of art (that is nonetheless, or perhaps inevitably, quite funny in places), of awe-inspiring scope, and yet one that should not dissuade aspiring directors from picking up a camera, thinking there's no way to top it. Pick up that camera. There are movies to make. Aim high.